The way in which people hold title to a property can have significant legal and tax implications, including whether the property must go through probate upon death and what taxes the heirs must pay when they sell it. Among the best ways to hold title to homes and other real property, attorneys say, is in a revocable living trust. There are many advantages, such as avoidance of probate costs and delays. Other than the cost of creating a living trust, and deeding real property into the living trust, there are no disadvantages. Until the death or disability of the trust creator, the home and other real estate in the living trust are treated normally. Also, stocks, bonds, bank accounts, automobiles and other major assets can also be held in the living trust and since the living trust is revocable, these assets can be bought, sold and financed normally. If the trustor becomes incompetent, the named alternate trustor (such as a spouse or adult child) takes over management of the trust assets. When the trustor dies, the assets are distributed according to the trust's terms. Privacy is an advantage, too. Unlike a will, which becomes part of the public probate file, the living trust terms remain private. Also, court challenges of living trusts are virtually impossible, whereas will challenges by disappointed relatives occur frequently. Sole ownership is just what it sounds like: You hold the title in your name alone, even if you own the property with other people. Tenancy in common means two people own the property together, but upon the death of one, the interest is distributed according to a will – or if there is no will, according to state law. 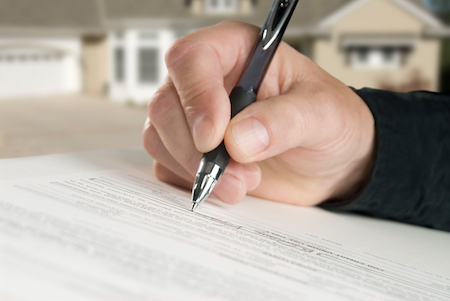 If asked, you should advise clients to evaluate which form of title is right for their situation based on who they want to end up with their interest in the property – and to consult with an attorney if they have specific questions regarding their personal or family situation.